“I didn’t know anything.” Freeform has just released new previews for their upcoming TV show Grown-ish. A spin-off of Black-ish, the comedy will follow “Zoey – Dre (Anthony Anderson) and Rainbow’s (Tracee Ellis Ross) popular, entitled, stylish and socially active 17-year-old daughter – as she heads off to college and quickly discovers that not everything goes her way once she leaves the nest.” The cast includes Yara Shahidi, Deon Cole, Chris Parnell, Emily Arlook, and Trevor Jackson. Grown-ish premieres on Freeform on January 3rd at 8 p.m. ET/PT. What do you think? Do you watch Black-ish? Will you check out Grown-ish? 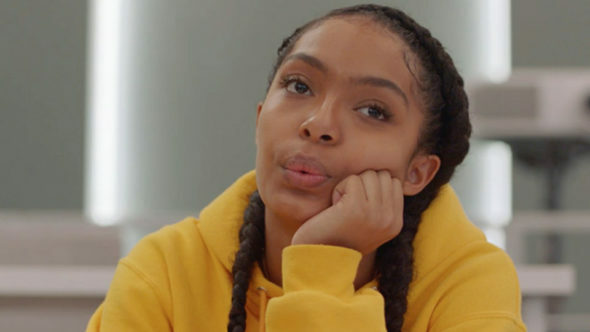 More about: Freeform TV shows: canceled or renewed?, Grown-ish, Grown-ish: canceled or renewed? Grown-ish on Freeform: Cancelled or Renewed for Season Three? Grown-ish: Is the Freeform TV Show Cancelled or Renewed for Season Two? Nobody wanted this……theycancelled other tv show because of this crap. TV shows no longer matter about people want. It’s about forcing crap like this down people throats. It will be on for years, no matter how bad the ratings are. Because it’s about others factors then dem/ratings.